American Flag Fundraiser Ideas "Sample"
Have a Project You Want to Fund in 2019? "Super Charged" Fundraising with Tested Program, and Flags Made in USA. Flag Fundraiser Ideas: ASK us for Free Sample... of Complete American Flag Kit. 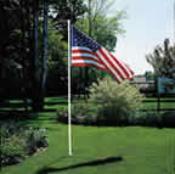 Includes 3' x 5' US flag, 10' pole & ground socket. Just pay s/h. Free Samples to Qualified Fundraiser Organizers. Call (866) 617-6275 to speak with Dale about Discounts & Fundraiser Details. Call (866) 617-6275 for Fundraiser Details, Samples & Discounts. Lewes-Rehoboth Rotary presents Flags for Heroes on Memorial Day. Do you need a boy scout flag fundraiser, school flag fundraiser or patriotic fundraiser like the successful Flags for Heroes? Let us show you how others are successfully using Flag Fundraisers.